The busy administrative capital of the Marche and the largest city in the region may not seem an obvious tourist centre. Give it time, though, and you may, like us, acquire a taste for the salt and spice of this restless sea port. Built on two hills that form an amphitheatre around the harbour, it was settled in the 4thC BC by Greek colonists from Syracuse. 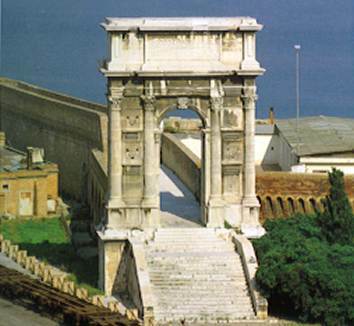 Later, the Romans exploited its sheltered anchorage and in 115 AD, under the Emperor Trajan, the present harbour walls were raised; the stately ceremonial marble arch standing forlornly at the end of the docks marks his achievement. 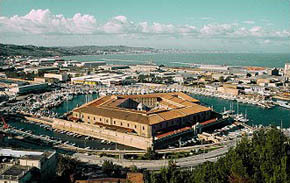 In the Middle Ages, the forces of the German Emperors, the Church and the Venetian Republic each made sure that Ancona was never able to establish itself as a powerful maritime republic. In 1532 it slid compliantly into the hands of the Papal States where it remained until the Unification of Italy. Neither was the 20thC kind to this old city; badly b ombed in the 2nd World War, it was again brought to its knees by a major earthquake in 1972. 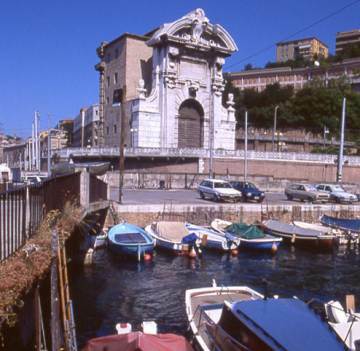 The oldest part of town straddles Colle Guasco, the hill above the port. On its peak, high above the agitation of the modern city, stands Ancona's finest church and its most obvious landmark, the Medieval Cathedral of San Ciriaco, a pleasing mix of Romanesque and Gothic. The austere interior is picked out with exotic Byzantine touches, a painted wooden roof in the form of an upturned boat, and a soaring 12-sided cupola - a place to linger in out of the summer heat. In the crypt you can glimpse the remains of an ancient pagan temple that provided the foundation for the church. To see the rest of the best, start your walk from the bottom of Corso Stamira down by the ferry docks. 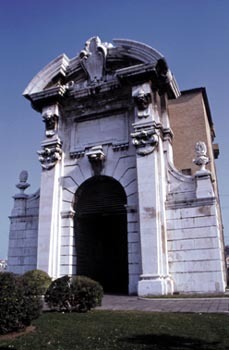 After noting the Venetian-Gothic facade of the ruined church of San Agostino cut across to nearby Piazza della Repubblica where Corso Garibaldi and Corso Mazzini start (the other two Corsi that complete the city's trinity of parallel main streets). The 19thC Teatro delle Muse that boxes in the square has now been re-opened after complete restoration. 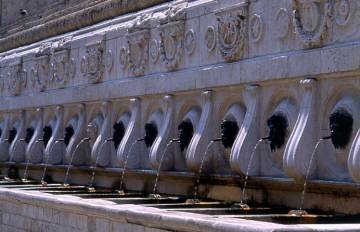 From here take a brief detour up Corso Mazzini to see the 16thC Fontana del Calamo, a regimented row of 13 masked spouts. Back down in Piazza della Repubblica, amble along Via della Loggia to see the statue-decked Loggia dei Mercanti, an outstanding example of flo rid Late Venetian-Gothic (the influence of Venice is never very far away here). 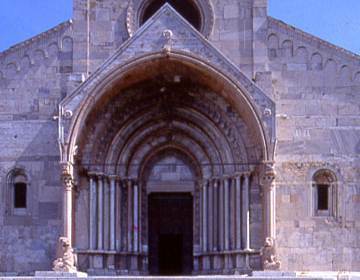 Further on is the singular 13thC front of Santa Maria della Piazza, rows of blind arches and plenty of fidgety carving. Inside, a glass panel in the pavement allows you to see the remains of the even older church below. From Via della Loggia walk up to Piazza del Plebiscito ruled over by a resplendent if cracked statue of Pope Clement XII. Over his shoulder is the Neoclassical Church of San Domenico with a stirring Titian Crucifixion above the high altar. As you climb up from the square on Via Pizzecolli you are in the heart of the oldest part of the city. Palazzo Bosdari at no.17 guards Ancona's Pinacoteca; paintings to look for here are Crivelli's chilly Madonna and Child, Titian's Virgin with Child and Saints, and Lorenzo Lotto's Sacra Conversazione. As you wind onwards and upwards through deserted Piazza del Senato and up Via Giovanni XXIII you will catch glimpses of the ruins of the Roman amphitheatre behind. A last effort and you are on the summit of Colle Guasco, with breath-taking views out to sea and the white, wind-blown face of the Cathedral behind you. Now take a sprightly walk back down for a fish lunch.